No cross-reactivity against mouse IFN-β, IFN-γ, and IFN-λ3. Minimal cross-reactivity against mouse IFN-α (0.004%). Low cross-reactivity against Rhesus monkey IFN-α (11%) and Cynomolgus monkey IFN-α (6%). Detects Cynomolgus monkey IFN-β. 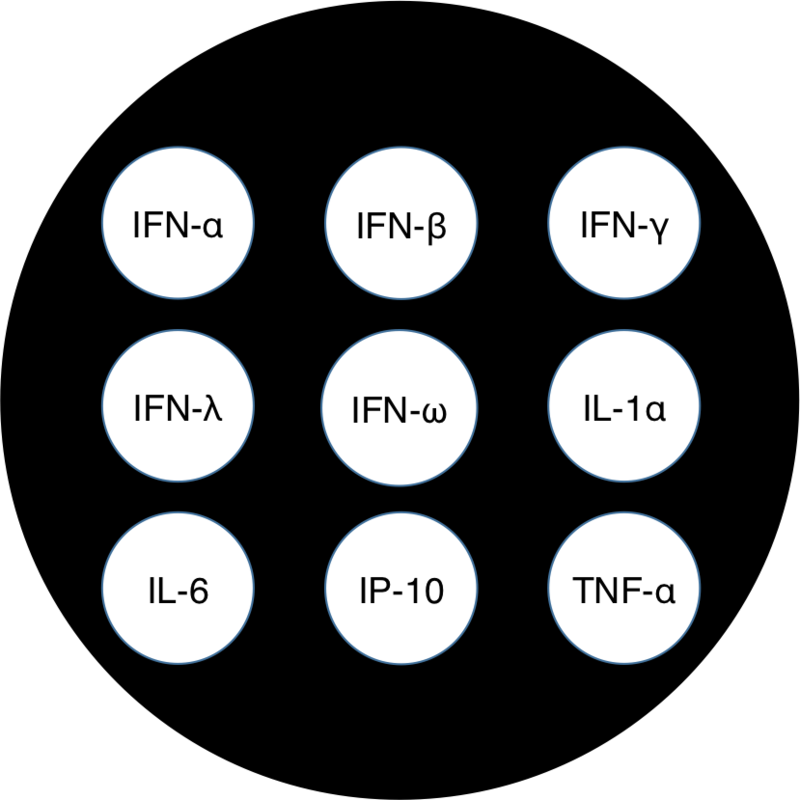 VeriPlex Human IFN Multiplex ELISA is a 9-Plex kit developed to simultaneously quantitate 9 human cytokines, including Interferon Alpha (IFN-α), Interferon Beta (IFN-β), Interferon Gamma (IFN-γ), Interferon Omega (IFN-ω), Interferon Lambda (IFN-λ1/2/3), Interleukin-1alpha (IL-1α), Interleukin-6 (IL-6), Interferon Gamma inducing protein-10 (IP-10), and Tumor Necrosis Factor-Alpha (TNF-α), in low volumes of serum, plasma and cell culture supernatants. This assay has been developed using the Q-PlexTM array spotting technology, in which capture antibodies to the different analytes are spotted in a single well in a 3x3 array. The functional format of the assay is as that of sandwich ELISA with a chemiluminiscent output. The assay is compatible with multiple matrices including tissue culture media, human serum, human plasma and buffers. This kit can be used with samples that are known to measure false positives in immunoassays such as samples containing human anti-mouse antibodies and rheumatoid factor. The use of this product has been evaluated in serum from Rheumatoid Arthritis patients.